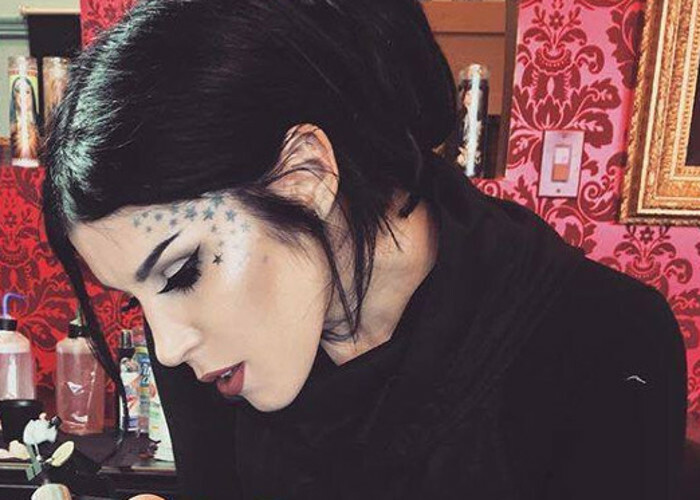 Kat Von D accidentally revealed some big news on her Instagram profile. Namely, the tattoo artist and beauty mogul posted a picture on her personal Instagram account of her tattooing the singer Toby Morse. In this case, the news had nothing to do with the singer’s decision to get another tattoo. Considering the fact that she is an established tattoo artist the picture itself seemed pretty normal. Anyway, there was something in the picture that her followers haven’t seen before. Kat Von D’s cheekbones had a new blinding glow and everybody started asking questions. Her followers were desperate to find out what brand is the highlighter and Kat Von D certainly pleased them with her answer. “Oh just wait for the new @katvondbeauty Metal Crush highlighters!!! Coming sooooooon !’ she replied to one of her followers. The goth beauty who didn’t wear highlighters in the past is finally launching her own highlighters. In a video from late 2015 with the infamous beauty guru known as NikkieTutorials Kat revealed that she never highlights her cheekbones. Nikkie got a permission to glaze Kat’s cheekbones and she really liked it. Take a look at the glorious moment when all of us had a chance to see Kat with a glow on her face for the first time. Obviously, Kat liked the outcome and decided that she definitely needs a highlighter in her life (and beauty line). The new highlighters will be part of the Crushed Metals family which only has eyeshadows so far. Kat is most certainly obsessed with the metallic finish lately. Just today her long-awaited Shade+Light Glimmer palette became	available for purchase and retails for $49. The palette is currently available at katvondbeauty.com and sephora.com. If you want to touch the palette before you purchase it you’ll have to wait until July 13. Note that Kat Von D’s latest release, as well as the entire line, is vegan and 100% cruelty-free. As you can see the glimmery	shades are highly pigmented and offer a blinding glimmer finish. Kat Von D Beauty announced another great news to their followers on Instagram. The brand will finally make their products available to the rest of the world. They are launching internationally in November. Now fans outside of the USA can enjoy Kat Von D’s extraordinary cruelty-free products.